MIAMI – HBO Latin America announced the premiere of the highly-anticipated fourth season of the triumphant original drama series GAME OF THRONES, winner of Emmy® and Golden Globe® awards. Full of action, adventure and ambition, the new season will debut on Sunday, April 6th in the Caribbean, simultaneously with the United States. Encouraged by the Red Wedding slaughter in Riverlands, which eliminated many of their Stark enemies, the Lannisters maintain the Iron Throne intact, but will they survive their egos, as well as the increasing threats from the North, South and East? While a determined Stannis Baratheon continues rebuilding his army in Dragonstone, a more immediate threat arrives from the South: the Lannister-loathing “Red Viper of Dorne,” Oberyn Martell. He arrives at King’s Landing to attend Joffrey and Margaery Tyrell’s wedding, and with a hidden agenda. In the North, the depleted Night’s Watch seems overmatched against unstoppable advances of Mance Rayder’s army of wildlings, which in turn is being trailed by an even more formidable enemy: the White Walkers. Meanwhile, Daenerys Targaryen, accompanied by her menacing trio of dragons and army of Unsullied, is on the verge of releasing Meereen, the largest city of Slaver’s Bay, which ultimately could provide enough boats to sail to Westeros and reclaim the Iron Throne. The upcoming fourth season of Game of Thrones features new talent, including Pedro Pascal (Oberyn Martell), Indira Varma (Ellaria Sand, Oberyn’s lover), Roger Ashton-Griffiths (Lord Mace Tyrell), Michiel Huisman (Daario Naharis, an allied mercenary to Daenerys), Yuri Kolokolnikov (Styr, a wildlings chief) and Hafþór Júlíus Björnsson (Ser Gregor Clegane, “The Mountain”). Returning this season are series regulars, including Emmy® and Golden Globe® winner Peter Dinklage (Tyrion Lannister), Nikolaj Coster-Waldau (Jaime Lannister), Lena Headey (Cersei Lannister), Emilia Clarke (Daenerys Targaryen), Charles Dance (Tywin Lannister), Aidan Gillen (Petyr “Littlefinger” Baelish), Jack Gleeson (Joffrey Baratheon), Kit Harington (Jon Snow), Diana Rigg (Lady Olenna Tyrell), Sophie Turner (Sansa Stark), Maisie Williams (Arya Stark), Isaac Hempstead Wright (Bran Stark), Alfie Allen (Theon Greyjoy), Jerome Flynn (Bronn), Conleth Hill (Varys), John Bradley (Samwell Tarly), Gwendoline Christie (Brienne of Tarth), Liam Cunningham (Davos Seaworth), Stephen Dillane (Stannis Baratheon), Natalie Dormer (Margaery Tyrell), Iain Glen (Jorah Mormont), Kristofer Hivju (Tormund Giantsbane), Sibel Kekilli (Shae), Rose Leslie (Ygritte), Rory McCann (Sandor “The Hound” Clegane), Michael McElhatton (Roose Bolton), Iwan Rheon (Ramsay Snow) and Carice van Houten (Melisandre). Other returning cast members include Jacob Anderson (Grey Worm), Thomas Brodie-Sangster (Jojen Reed), Nathalie Emmanuel (Missandei), Ciaran Hinds (Mance Rayder), Finn Jones (Loras Tyrell), Ellie Kendrick (Meera Reed), Kristian Nairn (Hodor) and Gemma Whelan (Yara Greyjoy). 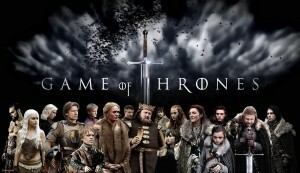 Composed of ten, one-hour episodes, Game of Thrones is executive produced by David Benioff, D.B. Weiss, Carolyn Strauss, Frank Doelger and Bernadette Caulfield; co-executive produced by Guymon Casady, Vince Gerardis and George R.R. Martin; and produced by Chris Newman and Greg Spence.